This Memorial Day weekend, we hope you'll stop by on Sunday to enjoy the offerings at Four Mile Run Farmers & Artisans Market. 4MRMarket is a community-led, all-volunteer effort. Your support means a lot to the whole 4MRMarket team and to all those who work so hard every day to make Four Mile Run Park, our City's largest park, truly a place for everyone to enjoy. It's taken a lot of effort and we're all proud that so much could be done with so little funds and a whole lot of effort. Our service to our community is how we choose to honor those who've sacrificed so much for us in the past, either by putting themselves in harms way or by simply having the courage to persevere. We are very grateful to them and to our many neighbors (including those who have served in almost every recent conflict) who continue to help us pull 4MRMarket and other projects together. We are humbled by the help. Although progress happens in fits and starts, and this year we've had to throw so much together in so short a time, we see 4MRMarket and associated park improvements as on-going and ever-improving enterprises. 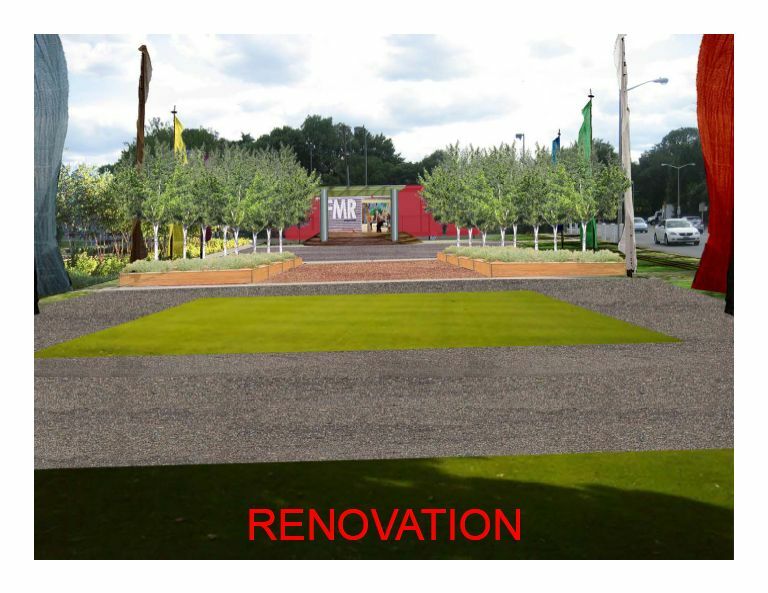 In our short life, 4MRMarket has been able to help attract thousands of dollars of donations and grants to transform vacant lots into great new open space: a vibrant gateway to Four Mile Run Park with the promise of a future restored Four Mile Run stream. We've helped small start-up natural food businesses get on their feet by offering them a level playing field with electronic payments...which we also saw further enhanced by the SNAP Double Dollar bonus program with our partner Inova Health Foundation and their funders like Whole Foods/Whole Planet Foundation. And with those partners, we've seen thousands of dollars worth of locally grown, healthy, fresh, nutritious foods delivered to those needing assistance, including immigrants from every continent. Because the Alexandria Commission for the Arts provided funding for a new outdoor stage thanks to a grant from the Virginia Commission for the Arts and the National Endowment for the Arts and a matching gift from an anonymous donor, 4MRMarket hosted the first performance last Sunday at the 4MRStage. It featured a fine group of locals, the Irish Breakfast Band with another performance later by the fantastic banjoist, Bill Mansfield. We're proud to be a part of these improvements and continue to solicit donations for these on-going efforts. We know that with the community's support we can expect to see shade trees start to fill the 4MRExpand plaza and make it a great space for the market, festivals and other events for years to come. We're proud of how 4MRMarket acts like a business incubator: creating opportunities for start-ups and entrepreneurs to experiment with new and exciting business models. We had the pleasure last year of hosting one such up-and-coming business. We miss the great works of pastry art that Kristin D'Angelo brought to 4MRMarket every Sunday, but we're excited to hear about this news: last week Sweet Hearts Patisserie celebrated their grand opening of a brand new store in Annapolis. We're a little sad that it's not in Alexandria, but wish her all the success she deserves. In the meantime, we hear from new businesses all the time, looking to start at 4MRMarket and we're proud to provide a place for them to strive to reach their dreams. It's exciting to see. We hope folks continue to check them out and give them a chance. Feedback is invaluable. 4MRMarket is proud to be at the forefront of a movement. And we're proud of partners like Inova for empowering so many with the additional spending power that comes with their sponsorship. And we're proud of our patrons who come out each week to support locally produced, sustainable small food businesses and, moreover, our whole community. 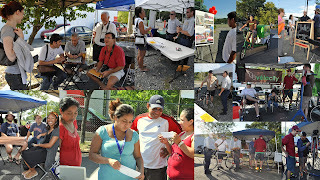 Without your support there would be no market in Arlandria bringing folks together. We're only just getting started, but 4MRMarket and its partners hope to continue to see growth in establishing a sense of place and the building of an inclusive community. 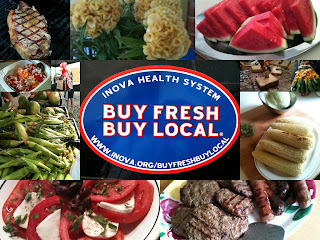 Remember, Buy Fresh, Buy Local. Olio Fresh olive oils and aged balsamics. 120520-D-BW835-029, a photo by ekc1024 on Flickr. 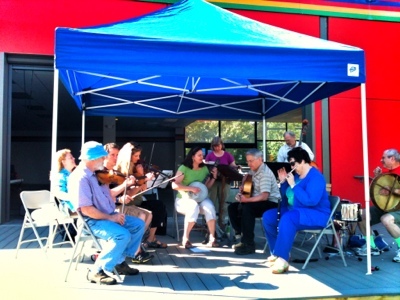 Last week was the grand opening of 4MRMarket, and it was one heck of a market. Thank you to everyone that came out. It was one of the busier days we've ever had, and we didn't even have our full compliment of vendors up and running yet. The transformation of the market site from a series of vacant lots to a spacious plaza was impressive to see close-up. It also made the market feel much more welcoming and enjoyable and several shoppers told us as much. When imagining the trees, pavement murals, seating areas, landscaping, and other decorative elements yet to come, it's easy to see this will be a great plaza for the market, festivals and other events for years to come. This week, we add market regular Pleitez Produce back into the fold, as well as a talented jewelry maker named Love and Glitter. Come out and expand your shopping list as the market grows throughout the season! Perhaps, if you haven't found that perfect gift for Mom yet, you can pick up a veggie garden worth of plants from C&T Produce and help her create her own backyard garden. That way, she'll remember you every time she enjoys a tasty caprese salad throughout the summer with homegrown tomatoes. Or how about a pendant or her favorite jewelry item from Love and Glitter? You could also invite Mom along to the market and sit in the 4MRMarket Lounge just enjoying the day, having breakfast, and shopping for a nice meal later that day! 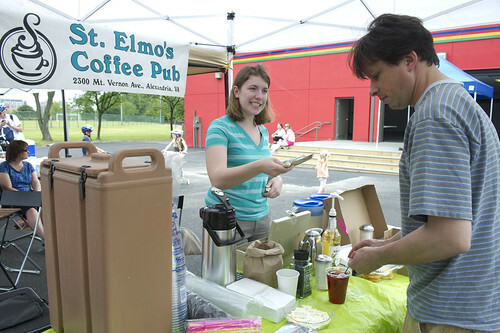 St. Elmo's probably will not be there again this week due to soon-to-be resolved staffing issues, but you can come by the 4MRMarket tent to get yourself a cup o' Joe to kick-start your morning. Number One Sons (Alexandria, VA) - Traditional fermented vegetables and soy products. Love and Glitter (Ellicott City, MD) - Our newest vendor brings an experienced jeweler into our midst. Come find that last minute gift for Mom! The Stifler Farm aka "What's For Dinner Now" will be off this week due to a previous commitment. Some aerial views of the Four Mile Run Expansion were just made available. See below. 4MR Expand was envisioned by the 2003 Arlandria Plan and incorporated into the 2005 Four Mile Run Restoration Master Plan. Four parcels were nominated to be acquired with Open Space Funds and after the City purchased the lots, environmental remediation was done to the site. 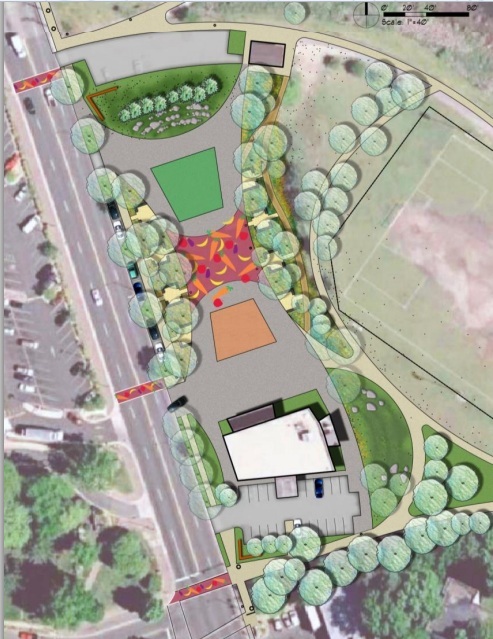 Citizen volunteers helped clean up the site and repair the building and a group of local architects and designers offered a plan for the site free of charge and unspent funds earmarked for Streetscape improvements in 2003 were redirected to finish the work. Architects Anonymous plans for the site are on-going and it is very much still a work in progress. The asphalt is barely dry but expect to see trees along Mt Vernon Avenue and the edges of the site very soon. 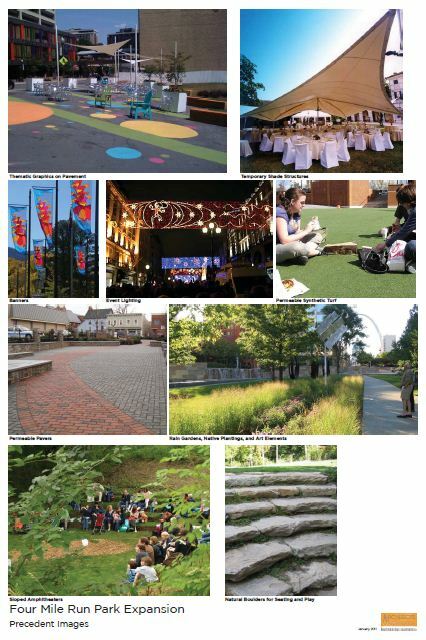 Examples of the kind of design elements that are planned to be incorporated. It's Almost Here: 2012 Opening Day is Sunday May 6! Get your reusable bags ready to fill with farm-fresh goodies and artisan made crafts. 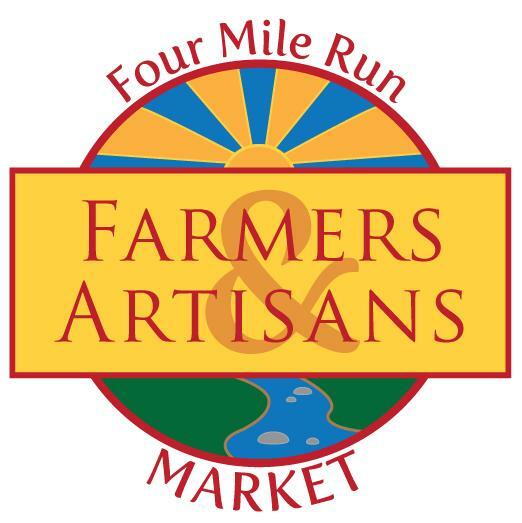 Sunday, May 6th will be the Four Mile Run Farmers and Artisans Market opening day! This should be a great season at 4MRMarket! Opening day raffle for all customers! Come out to 4MRMarket and be entered in a drawing to win 2 tickets and a parking pass to see the Nats play the Marling on May 12th. (Thanks to the generous donation from Hume Springs Citizens Association Vice President Jacob Cuomo). This season 4MRMarket will be held on a brand new plaza next to the brand new stage at the re-purposed Four Mile Run Conservatory building. From the re-purposed paint store, looking North, the first phase of construction brings a brand new, permeable and semi-permeable plaza. 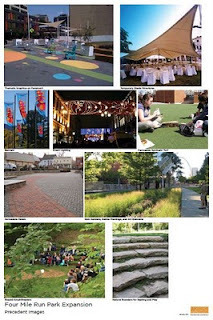 Soon, the plaza will be lined with trees, covered in eye-catching colors, and host to the weekly 4MRMarket and various concerts, performances, and community events of all types. 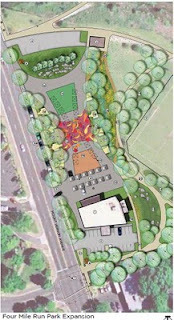 A future phase of construction will add more gardens, trees, and connecting paths to the new space. Community volunteer support will help some of this happen faster. A continuing work in progress, future volunteer gardening days are likely on the horizon, so please be ready to lend a hand as things come together. Check out the full 4MRMarket Report for all the details. To be sure you get all the 4MRMarket news and updates, you can follow us on Facebook, Twitter, and Google+. Also, please rate us on Yelp and anywhere else you use to rate your favorite spots to help us keep the market going strong this season. Come see the revitalization take shape. Sunday May 6th is the grand opening of the Four Mile Run Farmers & Artisans Market, 2012 Edition! This year, 4MRMarket will have a full slate of vendors and a new market environment. After all the hard work and volunteer effort, the Four Mile Run Park plaza area is nearly complete. Come see first hand 4MRMarket in its revitalized home and be amazed at the transformation of the gateway to the Alexandria's biggest park. 4MRMarket will be from 8am to 1pm again this season. The weather looks like it will be a sunny, perfect spring day in the mid 70s. What better way to spend a Sunday morning. Come enjoy fresh produce, coffee & tea, baked goods, and great artisan crafts. Just like last season, you can enjoy a tasty pastry and coffee in the 4MRMarket Lounge. See the "DONATE" note, below. 4MR Expand Phase 1 is just about complete, but the as yet unfunded Phase 2 includes trees, rain gardens, additional landscaping, banners, painting the plaza, etc. Help move renovations even further along! Your donation can help further the 4MR Park plans! (For more information about 4MR Expand, see here and here). HELP. If you'd like to volunteer with the 4MRMarket, go to: volunteer.4MRMarket.org to sign up or look for the "volunteer" tab on the 4MRMarket website. You'll be able to volunteer to help process SNAP/EBT sales, help us keep our books, help set up or tear down for the market, or help us find musicians to play the market. You can also find a Market Manager to ask to help, or email us at 4mrm@arlandria.org for more info. Benevolent Eaters Guild (Alexandria, VA) - Traditional fermented vegetables and soy products. Indigo's Friends - Come see Imani Russel's upcycled line of clothing and jewelry. Reduce, Reuse, and Upcycle, indeed! Stay tuned to find out more tomorrow.